Here in Columbia, MO, Dr. Philip Batson and the rest of our team strive to outfit our office with the latest and greatest in dental technology. These tools and techniques allow us to provide care that’s simpler and smoother than ever before, and digital X-rays are no exception. Instead of having to use hazardous chemicals to slowly develop the X-rays in a darkroom, the images are captured and sent to our computer system in a matter of seconds. The digital nature of the X-rays allows our team members to rotate the images, magnify them, and even color-code them so that patients of all ages can better understand them. 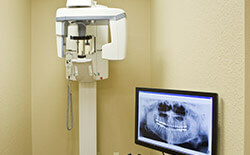 The X-rays can be easily sent to outside specialists or insurance companies. The X-rays can be stored digitally as well – no clunky files required! Best of all, the amount of radiation a patient has to experience is reduced by up to 90%.